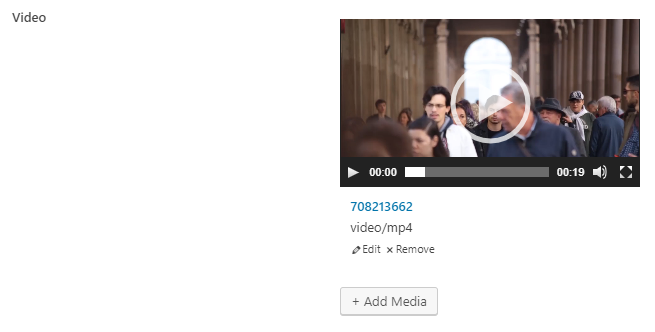 The video field uses WordPress media popup for selecting / uploading videos. max_file_uploads Max number of uploaded videos. Optional. force_delete Whether or not delete the videos from Media Library when deleting them from post meta (true or false)? Optional. Default false. max_status Display how many videos uploaded/remaining. Applied only when max_file_uploads is defined. true (default) or false. Optional. // Maximum video uploads. 0 = unlimited. // Delete videos from Media Library when remove it from post meta? Similar to file field, this field saves multiple values (video attachment IDs) in the database. Each value (video attachment ID) and is store in a single row in the database with the same meta key (similar to what add_post_meta does with last parameter false). Read more about rwmb_meta(), rwmb_the_value() and wp_video_shortcode().